With few exceptions, it seemed like every 3D printer at the first inaugural East Coast RepRap Festival (ERRF) was using a hotend built by E3D. There’s nothing inherently wrong with that; E3D makes solid open source products, and they deserve all the success they can get. But that being said, competition drives innovation, so we’re particularly interested anytime we see a new hotend that isn’t just an E3D V6 clone. The Mosquito from Slice Enginerring is definitely no E3D clone. In fact, it doesn’t look much like any 3D printer hotend you’ve ever seen before. Tiny and spindly, the look of the hotend certainly invokes its namesake. But despite its fragile appearance, this hotend can ramp up to a monstrous 500 C, making it effectively a bolt-on upgrade for your existing machine that will allow you to print in exotic materials such as PEEK. We spent a little time talking with Slice Engineering co-founder [Dan], and while there’s probably not much risk it’s going to dethrone E3D as the RepRap community’s favorite hotend, it might be worth considering if you’re thinking of putting together a high-performance printer. 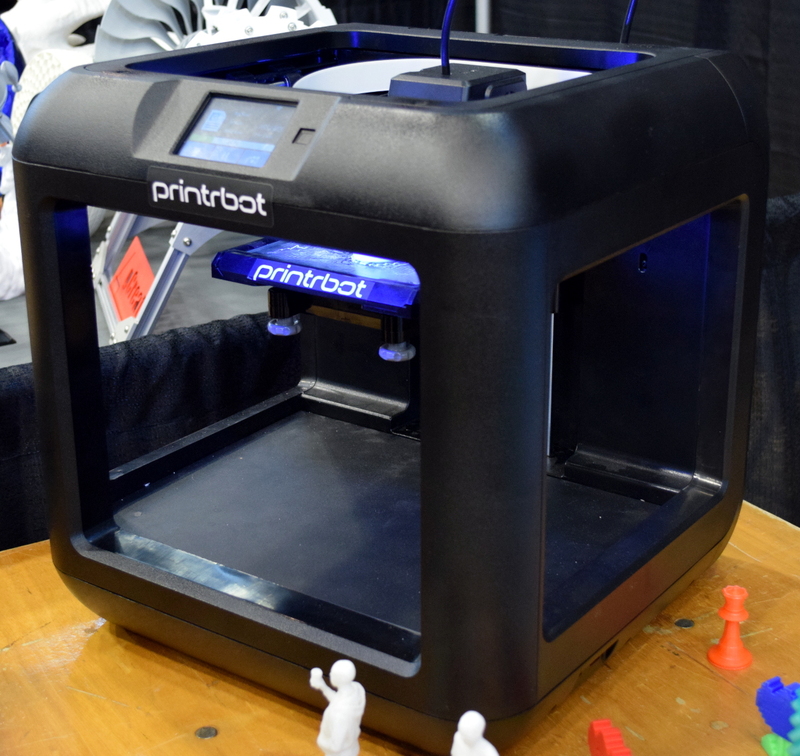 If you follow the desktop 3D printer market, it probably won’t surprise you to hear that nearly every 3D printer on display at the inaugural East Coast RepRap Festival (ERRF) was made in China. Even Printrbot CEO Brook Drumm had to admit that this was the year his company may finally bite the bullet and begin selling a branded and customized printer built overseas. When you can get a decent (but let’s be clear, not great) 3D printer for $200 USD, it’s no surprise that American and European manufacturers are having a hard time staying competitive. But not everyone is seduced by low-cost printers. They know they could buy a decent printer for a couple hundred bucks, but for them that’s not the point. Some hackers are just as (if not more) interested in designing and building the machines than they are churning out little plastic boats with the finished product. Luckily for us, these are also the type of folks who document their builds and make all their collected information and design files available for others under an open source license. Such builders exemplify the true spirit of the RepRap movement, and we’re happy to report that in a sea of imported printers, there were several interesting home built open source printers. Whether you want to build your own copy of one of these machines, or simply get inspired by some of the ideas their creators had, these machines are physical proof that just because you can order a cheap 3D printer on eBay right now doesn’t mean you have to. Last weekend was the inaugural East Coast RepRap Festival in beautiful Bel Air, Maryland. Like it’s related con, the Midwest RepRap Festival, ERRF is held in the middle of nowhere, surrounded by farms, and is filled with only people who want to be there. It is the anti-Maker Faire; only the people who have cool stuff to show off, awesome prints, and the latest technology come to these RepRap Fests. This was the first ERRF, and we’re looking forward to next year, where it will surely be bigger and better. One of the stand-out presenters at ERRF didn’t have a big printer. It didn’t have normal stepper motors. There weren’t Benchies or Marvins or whatever the standard test print is these days. [James] is showing off tiny printers. Half-scale printers. What’s half the size of a NEMA 17 stepper motor? A NEMA 8, apparently, something that isn’t actually a NEMA spec, and the two companies that make NEMA 8s have different bolt hole patterns. This is fun. If these printers look familiar, you’re right. A few years ago at the New York Maker Faire, we checked out these tiny little printers, and they do, surprisingly, print. There are a lot of tricks to make a half-size printer, but the most impressive by far is the tiny control board. This tiny little board is just 2.5 by 1.5 inches — much smaller than the standard RAMPS or RAMBO you’d expect on a DIY printer. On the board are five stepper drivers, support for two heaters, headers for OLEDs and Graphic LCDs, and a switching regulator. It’s a feat of microelectronics that’s impressive and necessary for a half-size printer. Since we last saw these tiny printers, [James] has been hard at work expanding what is possible with tiny printers. The most impressive feat from this year’s ERRF was a color-mixing printer built around the same electronics as the tiny printers. The setup uses normal-size stepper motors (can’t blame him) and a diamond-style hotend to theoretically print in three colors. If you’ve ever wanted a tiny printer, this is how you do it, and I assure you, they’re very, very cute. Are you around Philly, Baltimore, or DC, and looking for something fun to do this weekend? 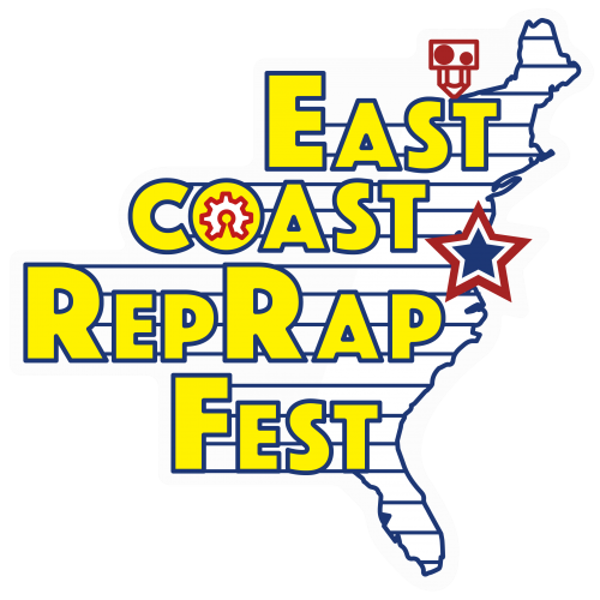 Great news, because Saturday sees the start of the first inaugural East Coast RepRap Festival in Bel Air, Maryland. Eh, we’ll grab some Bohs and boil up some crabs. It’ll be a great time. Regular readers of Hackaday should have heard of MRRF, the Midwest RepRap Festival, and the greatest 3D printer convention on the planet. There’s a reason it’s so good: it’s not a trade show. It’s simply everyone in the business and a ton of cool people heading out to the middle of Indiana one weekend per year and simply dorking out. All the heavy hitters were at MRRF last year, from [Prusa], to E3D, to [Brook] of Printrbot. The 3D Printing YouTubers made it out, and the entire event was simply a thousand or so people who were the best at what they do just hanging out. Want evidence a highly unorganized conference of 3D printing enthusiasts can be great? Here’s a working MakerBot Cupcake. Here’s full-color printing with cyan, magenta, yellow, black, and white filament. How about an infinite build volume printer? There are roundtables, demos, and talks. This is the state of 3D printing, and it inexplicably happens in the middle of nowhere every year. This weekend, the East Coast RepRap Festival is launching. This is not an event organized by SeeMeCNC, the hosts of the Midwest RepRap Festival. This is an independent event, and we have no idea how it’s going to turn out. That said, the schedule of events looks great with 3D printed pinewood (douglasfirfill?) derbies, and of course, the event space will be filled with strange and exotic homebuilt printers. The big names will be there, and it looks like this may be the beginning of something great. Hackaday is going to have some boots on the ground this weekend, and we’re going to be showing off the greatest and the best from ERRF. Tickets are still available, and it looks like this is shaping up to be a great weekend.